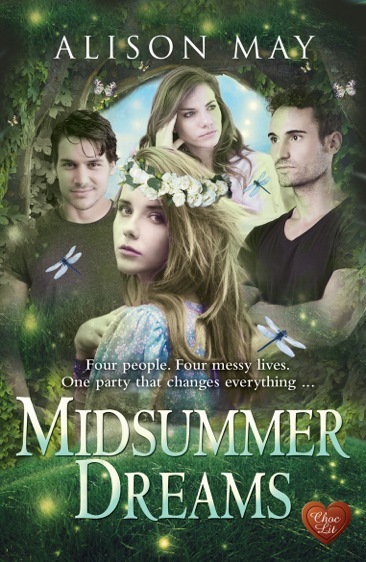 In celebration of the e-launch day for Alison May’s brand new romantic comedy, Midsummer Dreams, I’m posting today on the theme of all things dream-related. Alison’s given me three prompts and I’m set to go. At the tender age of thirteen, I was persuaded to dress up in a floaty yellow nightdress belonging to my grandmother, put on a crown of flowers, and take on the role of Titania. No acting was involved, I was just on an amateur dramatic society’s float at a carnival. All the same, the situation was what my own teenage daughters would refer to as #awkward. Playing the part of Oberon was a local retired GP, who was seventy if he was a day. He wore a cardboard crown, cape and tights. “But don’t worry,” my grandmother said, “he’s an awfully nice man.” I’m sure he was. My brother had to be Puck, and got the tights treatment too, along with a straw hat and fisherman’s smock. We also had a very sweet Peaseblossom, and a large soft-toy donkey dressed up in a shirt and shorts. The pièce de résistance, was the GP’s wife, who wanted to be on the float too, and had dressed up as Yum Yum from The Mikado. Apparently it was their next production, but I don’t think that was an adequate excuse. It’s a measure of how very much I loved my grandmother that I didn’t run for the hills. There are lots of other bloggers posting on the dream theme, so keep an eye out for #MidsummerDreams on Twitter. The vivid picture of the float and its inhabitants could be considered a nightmare on its own! I have that dream where you open a cupboard and find a whole new wing to the house too. I love that one!